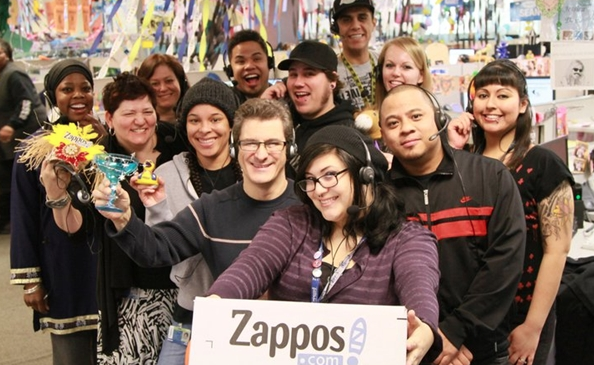 CASE STUDY: How Zappos win the heart of customers by putting their core values into business? Home > Blog > Blog > CASE STUDY: How Zappos win the heart of customers by putting their core values into business? Founded in 1999, Zappos.com is an online shoe and apparel shop. Zappos is the world’s largest online shoe store with the best possible product and selection. In July 2009, it was acquired by Amazon.com in an all-stock deal worth around $1.2 billion. Zappos still operates as a liberated entity with its brand and culture intact. Some 80% of Zappos sales come from shoes: in 50,000 ranges comprising well-known brands, hard-to-find sizes, American-made and vegan shoes. 75% percent of its business comes from repeat clients. A high-end line of shoes called Zappos Couture was launched in 2004. In1998, Zappos.com founder Nick Swinmurn was searching for a certain pair of shoes in San Francisco mall. He found difficulty in finding the right style, right color, and right size shoe. Nick spent a couple of hour in the mall, walking from store to store, finally going home frustrated and infuriated. Nick found there were no major online stores that focused on shoes. He quit his job and started an online portal, Shoesite.com. He changed its name to “Zapos”, i.e. derived from Zapatos; a Spanish word for “Shoe”. In 1999, Zappos was born. Zappos is a unique concept, model online business, and a gratification point built from scratch. An online business that prime focused on customers, giving them quality, choice, free shipping and easy returns. Zappos is known for its zany corporate culture. Zappos’ conventional organizational structure is being replaced with “Holacracy”, a radical “self-governing” operating system where there are no job titles and no managers. Zappos, which has 1,500 employees, will be the largest company to date to implement Holacracy. The company has apparently distinct the causal link between a happy workforce and an equally balanced “purpose with profit” bottom line. A “bureaucracy buster”, this new policy energies fresh ideas by removing roadblocks and inspires modernization to come from anywhere within the company. The company’s tagline and principal philosophy is to “Deliver Wow” and since 1999; it has done so in scoops, serving millions of customers across the globe. Zappos has built their business completely on the digital empire. Zappos has a strong presence on multiple social networks. They are near the top of major brand marketing in customer service and social media. They set a high bar when it comes to being social and engaging its customer. The company has remained engrossed entirely on e-commerce, competing on those who prefer excellent customer service. They set the mark for the whole world to target in customer service. And they make it the core of their marketing strategy. Zappos is one of the initial adopters of the use of social media for marketing and social e-commerce. It has taken a leadership position. Their social media tactic revolves around their company website and main social media networks, including Twitter, Facebook, Pinterest, Instagram ,YouTube and Google +. Zappos has a massive 2,173,050 fan following on Facebook, more than 63.6 K followers on Twitter and huge 29.3K followers on Pinterest with 56.7 likes on its board. Instagram witness more than 75.1 K followers. YouTube Channel of Zappos has around 5,932 subscribers. Even, it’s Google plus account has more than 226 K followers. Zappos.com ran photo ads that showcased its most visually attractive products. 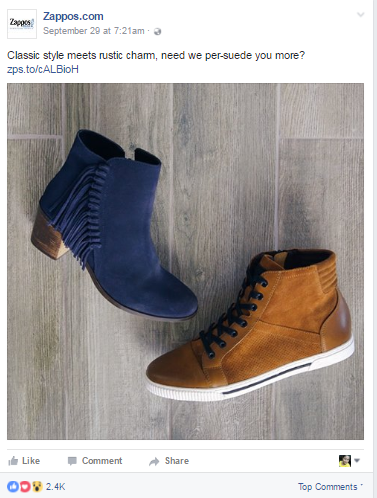 To reach the right people, Zappos targeted people who had expressed an interest in shoes on Facebook. It also segmented the consumers and then targeted those using Custom Audiences. Facebook helped Zappos considerably grow its sales revenue and drive people to its website, fetching the brand’s biggest revenue-generator. 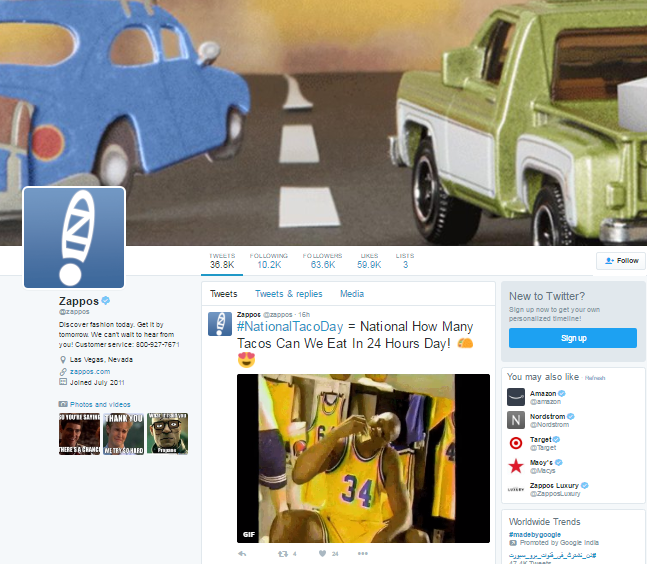 Zappos has a very well and active Twitter following, and it engages with its followers with a great deal of spirit and effectiveness. It’s great at sharing content that has nothing to do with its brand, just amiably for entertainment. Zappos.com is a maker of online video in the e-commerce market. Online video has proven to be a very effective medium for e-commerce. Online video is seeing a 50% increase in viewership year over year. 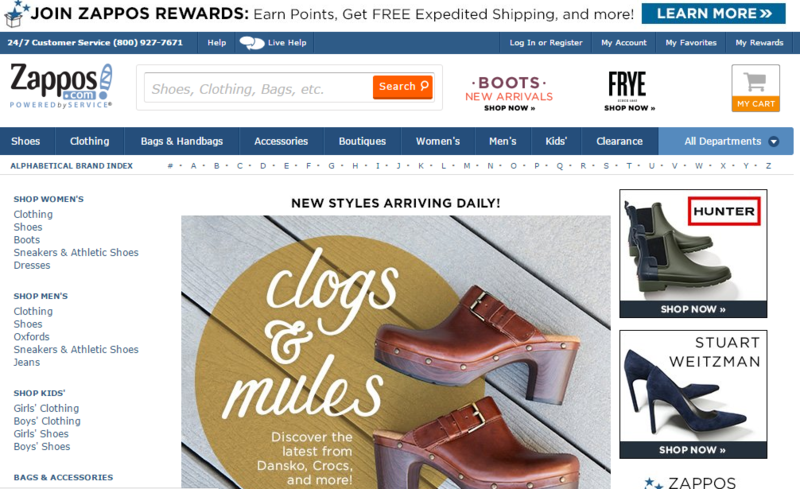 Zappos.com includes videos on detailed products, analyses, how-to videos and much more. YouTube Channel of Zappos has around 5,932 subscribers with 5,426,442 views. It’s a place where customers can look out enjoyable and informative videos. Zappos uses high-end content to showcase the global trends that have proved an endearing principle for the brand name. Zappos is using most pioneering content marketing efforts as its digital magazine, “Zappos Now”, available on iPad. The publication “explores the exciting and ever-evolving world of style.” The readers can review fashion tips, try out cooperating troupes and gain from how to “work it” spreads. After few years of its inaugural, Zappos grow into one of the leading shoe stores in the world, offering shoes in an extensive range of styles and sizes. In 2001, Zappos’s yearly sales bringing in $8.6 million. In 2004, Zappos did $184 million in gross sales and secured its first round of venture capital, a $35 million investment from Sequoia Capital. Over the next 3 years, Zappos folded their yearly revenues, striking $840 million in gross sales by 2007 and expanded to include handbags, eyewear, clothing, watches, and kids’ merchandise. Constant growth by Zappos led to $1 billion in yearly sales in 2008, whipping their inner goal to $1 billion by two years. Zappos is showing a big increase in profits for 2015. The downtown-headquartered store plans an operating profit of $97 million in 2015, 77.9 % jump from the $54.5 million in profits in 2014. Zappos received the top 10 for Customer’s Choice Awards in 2010 and winning the 2011 Stevie award for Sales & Customer Service. In 2009, Fortune magazine ranked Zappos 23rd on its list of the best companies to work for.